3D volume models from computer tomographs provide comprehensive data about inner and outer characteristics of a part. Using the GOM Inspect software, you can easily import volume data in all common formats, such as *.vgi, *.vgl, *.pcr, *.exv, *.rek, etc., into an established software format and inspect surfaces as usual. You can easily drag & drop the volume data into the software. Workflows are significantly accelerated and simplified by automatic conversion of CT voxel data into surface data (STL mesh). Mono- and multi-material objects as well as multiple parts can be evaluated. Multiple materials of an object are then displayed as separate surface meshes. 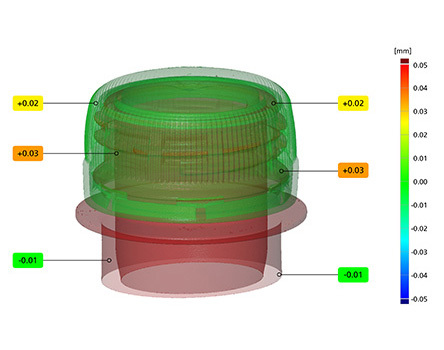 The GOM Inspect software distinguishes between different materials of the scanned object in order to generate a surface for each individual material. In addition, the polygonization area can be restricted, which reduces the import to relevant partial areas of the overall volume. All surfaces – even internal structures – can be used for shape and dimension analyses or nominal/actual comparisons. To try out the volume data import in GOM Inspect, simply download this sample data.